Sean Michael Wilson and Mike Collins' adaptation makes great use of their longer page count for this scene. For instance, the knocker gets several panels all to itself. As Scrooge approaches his front door, he pulls out his key and we see the knocker (shaped like a lion, which is also how Marvel had it). Then a turn of the page reveals a shockingly large image of Marley's ghostly face (with waving hair to represent Marley's independent atmosphere), followed by smaller panels of Scrooge rubbing his eyes and closely inspecting the knocker that has now returned to normal. It's a scary, effective sequence. Inside, text reveals that the staircase was broad and mentions that Scrooge thought he saw a hearse drive up it. But there's no hearse in the art, just some misty lines suggesting that something may have passed that way and turned a corner at the top of the stairs. Again, very effective. After Scrooge checks out his rooms, the text leaves us alone while he eats his gruel. There's a nice close up of the Dutch tiles on the fireplace, followed by a close up of Scrooge's worried eyes, then back to the tiles, which now all contain Marley's face. Without any text, it suggests that Scrooge is actually seeing Marley again on the fireplace, but after the hearse, there's enough doubt about Scrooge's senses that we can suspect his mind is playing tricks. The bell sequence is also nicely done. There's just enough text to explain that the bell is disused, then the art and sound effects take over to create a cacophony of clanging that ends abruptly. As soon as that's done, the clanging is replaced by creaks and clanks. Panels of Scrooge's listening face are interspersed with images of the staircase: first empty with a ghostly glow, then a close up of spectral chains, then cash boxes being dragged up the stairs. It's all super creepy and ends with a giant, top-of-the-page panel of Marley's appearing in Scrooge's room. Collins draws Marley as translucent, rather than transparent. A background detail will occasionally show through his body, but for the most part he looks solid with the same ghostly glow we saw coming up the stairs. His first panel is pretty cool, with a pose that reminded me of Jack Kirby, but a character design that has some Jack Davis in it. When Marley eventually pulls off his bandage, his jaw drops to an unnatural degree. Classics Illustrated had Marley gape-mouthed, but looking more or less like any slack-jawed mortal. Marvel gave Marley a supernaturally large gape, but it ended up looking silly. Collins' version is as horrifying as it should be. Marley's reaction to Scrooge's doubt of course is to rattle his chains and shriek horribly. It has the desired effect and Scrooge is adequately frightened the rest of the scene. I especially like a wordless panel of Scrooge's pitiful, worried face right after Marley's speech about "why did I walk through crowds of fellow-beings with my eyes turned down?" Wilson and Collins work these little beats all through the comic so far. In this case, the effect is to show that Scrooge isn't just afraid of Marley, but seems also to be internalizing his message. He's still not at all excited about receiving three more spirits, but I feel like Marley's made more headway on this version than either Classics Illustrated, Marvel, or even Dickens'. The coming ghosts will keep the same schedule that Dickens had them on (one a night for three nights). Oh! Something this version helped me notice is a partial answer to a question Joe raised in the comments the other day. It's in Dickens' text, too, but I missed the part where Marley says that Scrooge's chance and hope for redemption is "of my procuring." As the conversation continues, he clarifies that the "chance and hope" are the three ghosts, so apparently this is all something that Marley asked to happen and has orchestrated. That still doesn't answer the question of why Marley had to spend so much time sitting invisible next to Scrooge before finally being able to deliver his message, but it does reveal Marley to be more integral to these events than I often give him credit for. After all the warnings and announcements, Marley silently wraps his jaw closed again, straightens his chains (love that bit), and flies out the window. 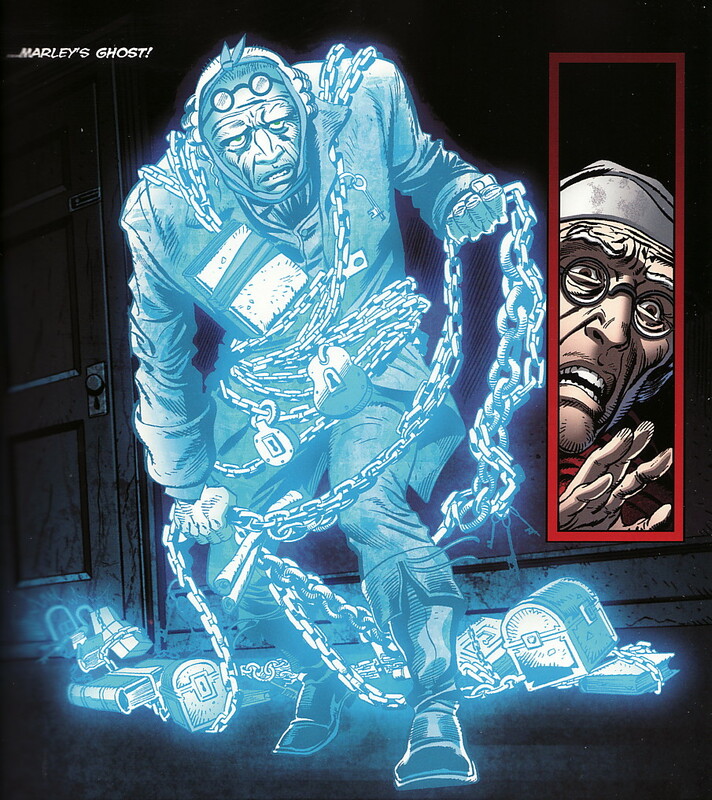 Scrooge follows to see a full splash page of mournful spirits flying around with a small image of a woman holding a baby in the street below. There's no mention of their trying to help her, so it's a subtle image. But like all the other choices Wilson and Collins made in this scene, I quite like it. Seems like quite the version of the story. As for the clarification of Marley being the one to take a stab at Scrooge's redemption, maybe time is different for spirits? But then again, with the way Marley speaks, time might be even slower for him, so I don't know. Maybe he has asked for years and now it is only now "someone" has heeded his plea. Interesting, anyway.